Peanut butter has been a popular staple in the American diet, but in recent years, more varieties of nut butters have become available and are gaining recognition for their health benefits. From almond to cashew and sesame to walnut, seed and nut butters contain great nutrients and have been widely used as a sandwich spread. Despite their bad reputation for being high in fat, nut butters contain natural, healthy fats that are good for your heart, cholesterol, and help reduce the risk of type 2 diabetes. Because of its popularity and widespread use, peanut butter kind of has a monopoly on nut butter. Many people are unaware of the alternatives that are available. However, in recent years, other nut butters have been reaching store shelves and gaining recognition by foodies and health experts alike. For people with peanut butter allergies, the rise of alternative seed and nut butters have been a great way to still enjoy sandwich spreads and their health benefits. Every nut has different health benefits. However, it’s important to be aware of other ingredients in the nut butter that can make it unhealthy, such as salt and sugar. Healthy, high quality nut butters are made without additional sweeteners or preservatives and provide similar nutrition to the nuts they’re made from. Be sure to check the label for these extra ingredients and also beware of the varieties that contain hydrogenated oil, as they contain trans fats. Manufacturers add these ingredients to keep the oil from separating during storage. However, this separation is normal and just requires you to stir the seed or nut butter before using it. To keep the nut butter oil from separating during storage anyway, you can store the jars upside down in your pantry. While it is true that they’re high in calories, don’t let the fear of fat steer you away from nuts, as they are a phenomenal source of vitamins, minerals, and nutrients. All nut butters contain heart-healthy unsaturated fats, phytosterols, protein, and fiber, but their specific nutritional value depends on what type of nut being used. One of the benefits of eating nut butters is that they also contain a healthy dose of vitamin E, an antioxidant that protects essential fats in your body, supports healthy skin and hair, and helps keep your immune system strong. Nut butters can be used as a sandwich spread, but they can also be added to other healthy snacks such as apples slices or celery to make them more filling and nutrient dense. The protein, fiber, and different types of fats found in nut butter help you feel full and satiated, which can help your energy levels stay constant throughout the day. That’s why, despite their fat content, research has shown that regular nut consumption can lower the risk of weight gain. You can incorporate nut butters into your diet every week, but do not overdo it. The key to getting all of the health benefits from seed and nut butters is to eat them in moderation. Here are the most common types of nut butters and their health benefits. Peanut butter provides our bodies with several key nutrients such as calcium, magnesium, zinc, and iron, while also serving as a good source of protein and fat. However, in comparison to other nut butters, peanut butter has the least amount of nutritious vitamins and minerals. That aside, because of its high protein content, peanut butter has a high satiety value, which helps you eat less at other times of the day. In fact, peanut butter contains one of the highest amounts of protein among seed and nut butters. 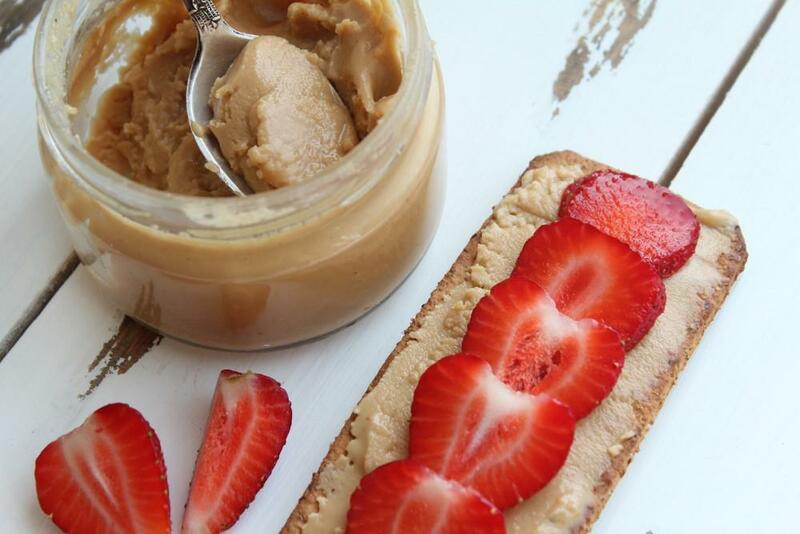 2 tablespoons of peanut butter contains 7 grams of protein. Almond butter is one of the most nutrient-dense nut butters available. Almond butter contains several important minerals for maintaining strong bones and contains much more calcium, magnesium, manganese and phosphorus than peanut butter. 2 tablespoons of almond butter contains about 50% of your daily vitamin E requirement. Vitamin E is an essential antioxidant which is eye and heart protective. 2/3rd of almond butter's fat is actually heart-healthy monounsaturated fats. Almond butter is also highest in fiber, lowest in saturated fat, and may be help improve cholesterol panels. Cashew butter is smooth, creamy, and slightly lower in fat than other nut butters. Although it doesn’t contain omega-3 fatty acids, it’s one of the best sources of monounsaturated fatty acids, essential amino acids, and magnesium. These nutrients are beneficial for blood pressure, sugar and cholesterol control, bone health, the immune system, and your metabolism. Walnut butter has an earthy, buttery taste. It is very similar to peanut butter in nutritional value, aside from the fact that it contains the greatest amount of omega-3 fatty acids, specifically alpha-linolenic acid (ALA) and polyphenols. Since omega-3 fats have anti-inflammatory properties, they can help improve arthritis and other autoimmune diseases. What’s Right for Your Health? There are so many nut butters to choose from! There is also sunflower seed butter, soy nut butter, tahini (sesame seed butter), and more. If there’s a nut, you can make butter out of it. Depending on your own personal taste and nutritional needs, nut butters are an easy way to invigorate your diet with more variety and help boost your overall health. It is easy to make your own nut butter. Just put any type of seed or nut in a blender and process them until a paste forms. Pure nut butter do not need any extra ingredients. Many recipes allow for added salt and sweeteners only for taste preference. If you are concerned about the impact of your eating and lifestyle choices on your long term health, contact Dr. Payal Bhandari M.D. Dr. Bhandari is an integrative functional medicine physician who specializes in attending to all aspects of an individual’s life. By understanding the root cause of illness, Dr. Bhandari will guide you through how your symptoms or illness can be reversed by most likely making simple shifts in your lifestyle and addressing other environmental factors. Healthy living for patients is dear to Dr. Bhandari’s heart. She loves to help people take back control of their health through simple tips we can each be empowered by.